Peas fresh from the garden, and by fresh we mean up to an hour old, are one of nature's delights. This is one vegetable where the supermarkets simply can't produce a comparable crop. Fresh is most definitely best. Another great advantage of peas is their preference for cooler conditions and production of a crop early in the year. This makes them ideal for the British climate. With dwarf, semi-dwarf and climbing varieties one of them is sure to fit into your garden or allotment. When you buy your pea seeds they will be classified as one of three types based on how long they take to be ready for harvest. Peas are classified as "legume" vegetables for the purposes of crop rotation. It is essential not to grow them on the same soil in two years running. A three year rotation plan should be sufficient to avoid any build up of pests. For details of a suggested crop rotation plan, click here. Like many vegetables peas do best in a full-sun position with a well-dug, water retaining soil. Full sun is not critical for maincrop peas which can cope well with partial shade but early varieties do need lots of sun. They hate water logged soil and seeds will not germinate if the weather is cold and the soil very wet. To improve your chances of success with early peas cover the planting area with black plastic or cloches a week or so prior to planting. This will warm up the soil and stop too much rain water logging it. For us, the best pea is the climbing variety Alderman. This can produce truly large crops of peas over a long period so we take care to prepare the soil especially we for this variety. 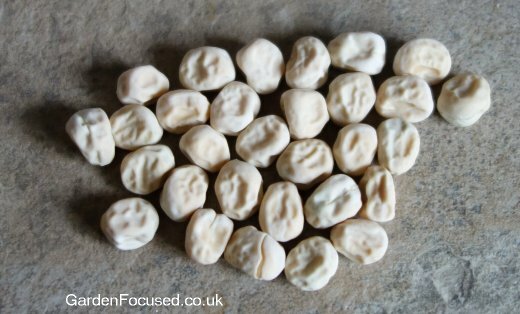 See our in depth description of the Alderman pea variety (sometimes known as the "Victorian Colossal Climbing Pea") not only for the pest free nature and massive crops of this variety but also how to prepare the ground to make the most of its cropping potential. There is a misconception amongst many gardeners that early pea varieties such as Kelvedon Wonder should be sown earlier than maincrop varieties such as Alderman but this is not true. All peas seeds should be sown at the same time, it's just that early varieties mature quicker compared to maincrop varieties. if you artificially raise the soil temperature using cloches, black plastic covering or similar mechanisms. 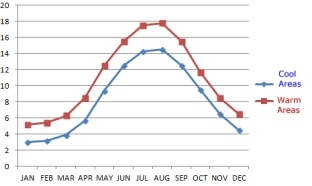 The diagram below shows natural soil temperature averages (in °C), firstly in warm areas of the UK (the red line) and in cooler areas (the blue line). The majority of areas in the UK will fall somewhere between these two lines. The chart shows the average of day and night time temperatures and you can assume that the day time temperature is about 2°C higher than the averages shown below. The soil temperature is the key to sowing pea seeds early enough so that you end up with an early crop but not so early that the seeds fail to germinate. If the temperature is high enough for just a couple of hours, pea seeds will start the germination process. There are two main types of peas as far as planting is concerned, climbing peas which will grow to 2.1m / 7ft high if you let them (e.g. Alderman) and dwarf peas (e.g. Kelvedon Wonder) which will grow to a height of anything between 60cm / 2ft to 1.2m / 4ft. Peas of this type will be partly self-supporting and require only short twigs or sticks to keep them upright. For this reason they are best sown quite densely and with two or three plants wide per row. Dig out shallow trench about 5cm / 2in deep and 15cm / 6in wide. If the soil is dry give it a good watering. There is no need for precision when sowing the seeds, just scatter them in the trench so that they are about 2cm / ¾in apart. You could, if you want, sow three neat lines of seeds in the trench but it won't make any difference. The seeds will almost all germinate in good dryish weather but birds love to eat them and mice can very often be a problem. If you know that you are likely to be troubled by either pest then cover the soil with wire netting (the best bet for preventing mice damage) or horticultural fleece. The fleece should be removed when the peas have germinated and are about 2cm / ¾in high. Question and Answer: Do pea seedlings need to to be thinned? The short answer is no. At a spacing of 2cm / ¾in apart peas will grow fine and will not need to be thinned. You need a lot of pea plants to grow a plentiful crop of peas! If you need to sow more then one row then space each row about 30cm / 1ft apart at least. The reason for spacing the rows is simply to enable you to get between them to harvest the peas. There are many methods for sowing climbing peas and they differ slightly depending on the support method you plan to use. All the peas though should be sown at a depth of about 5cm / 2in. With climbing peas you will need to erect the supports before sowing your peas. A wigwam always looks attractive as does two single rows about 45cm / 18in apart with the canes tied together at the top. 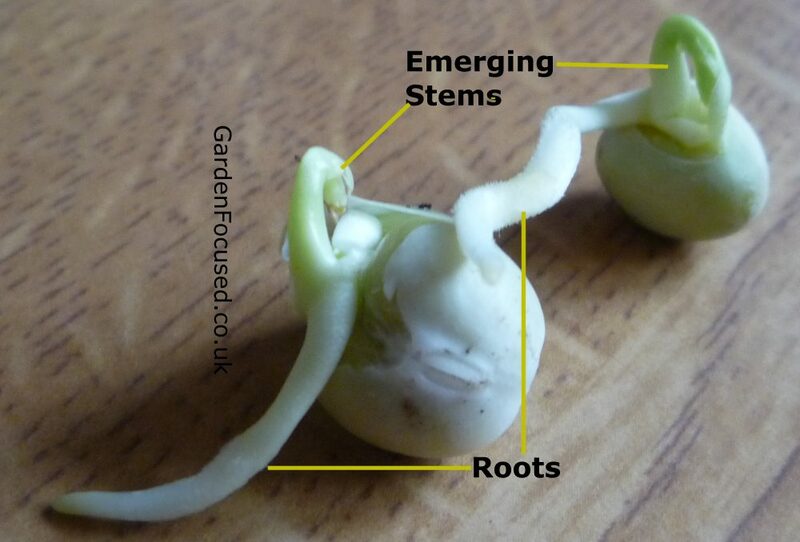 Peas wont grow up canes like runner beans they need more support for their tendrils to grab hold of and climb up. Pea netting is good for this spread over the canes but string tied onto the canes horizontally at 15cm / 6in intervals will also do the same job at less cost. Sow three seeds at the base of every cane used. No thinning of the seedlings is required. If you want to get a head start with your pea plants it's easy to sow them indoors or in a greenhouse. In the first week of March fill an 8cm / 3in pot with multi-purpose compost, make a hole about 5cm 2in deep and drop a seed in. Cover with compost, water well and place in a cool place indoors. The seedlings will emerge in just under a week. As soon as they do, move the seedlings to a light position (not in direct sunlight) and let them grow on until they are about 12cm / 5in high. Harden the seedlings off over a week and then plant them outside in their final positions. The germination rate for peas sown outside is good, about 80% is normal. The same goes for those sown indoors. You can pre-germinate the seeds indoors and avoid planting ones which fail to germinate. Wet a kitchen towel, place the seeds on it and cover with another moist kitchen towel. Place them in a cool room indoors and check them after 24 hors to see if they have sprouted. If they haven't, wait another 12 hours and check again. Ideally you want to sow them in pots as described above as soon as a small sprout appears. 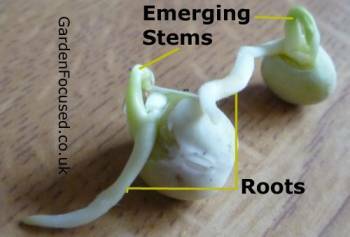 The picture above shows a couple of pea seeds which have sprouted slightly longer than is ideal but they will still be fine to sow in multi-purpose if you take care not to break the root and stem shoots. When grown on a well-prepared soil (adding lots of composted organic matter) the main care need of peas is a regular supply of water especially when the pods are forming. Don't water log the soil but keep it moist. Weeds also need to be kept to a minimum to avoid competition for water and nutrients. A layer of well-rotted compost around the growing plants will help them grow well. As far as nutrients are concerned don't add nitrogen fertilisers such as Growmore, this will only encourage leafy growth at the expense of pea production. Peas generate enough nitrogen of their own in little nodules which form on the roots. We feed once a month with blood, fish and bone although this is done on all our soil not just peas. Climbing peas should have their supports put in place when seeds are sown as mentioned above. Most dwarf peas will need gentle support, especially some of the taller varieties. Use twigs and sticks to do this. We have found that raspberry bush prunings are ideal for this purpose and we keep them from year to year for just this purpose - they normally last two to three years. Pea plants are self-pollinating and have no need of insects or wind as far as pollination is concerned. So, if the grown under netting or a vegetable cage they will still produce a crop of peas. Our pea calendar at the top of this page can be adjusted for your area of the UK to give you an approximate idea of when to harvest. But in reality it all depends on how big you like your peas. Many varieties can be harvested early as a mange tout crop, give it a try and see what they taste like. Some people like their crop to be "petit pois" size and others appreciate the excellent digestive qualities of overgrown peas whilst most prefer them to be somewhere in between. Whatever your tastes, don't waste the larger ones, use them for pea and ham (or just plain pea) soup. Pea plants produce of their best when harvested regularly, this encourages them to produce more pods. At the end of their useful life cut the tops off and add to the compost heap. The roots can be left in the ground to rot down and provide body for your soil next year. Recent investigations have revealed that the little nodules which peas produce on their roots only provide the plants with nitrogen, they are totally ineffective at fertilising the soil with nitrogen. Beware of articles on peas which claim otherwise because they are out of date. In reality the nitrogen in pea root nodules transfers to the pea pods when they start to form and almost none is left in the roots when the peas are harvested. Decide first if you want to grow dwarf varieties, climbers or both. We would highly recommend giving climbers a try. They have gone out of fashion slightly but they produce the biggest crop of the sweetest peas with very reduced pest and disease problems. Next read our independent review of pea varieties which are suitable for growing in the UK. Early Onward are one of the most reliable varieties of peas, producing a good crop in almost all years. Slightly larger than average pods with an average of seven peas per pod ....... Click here for the full review of this variety. An early maincrop variety which is repeatedly recommended by amateur gardeners in all parts of the UK. Reliable and well-tried, it produces a good crop of peas (eight per pod). Click here for the full review of this variety. Can be grown without support because this is a very compact plant. An excellent crop of peas which are held well above ground level. This is classed as a first early variety which is fine for some uses but flavour is definitely not the best. 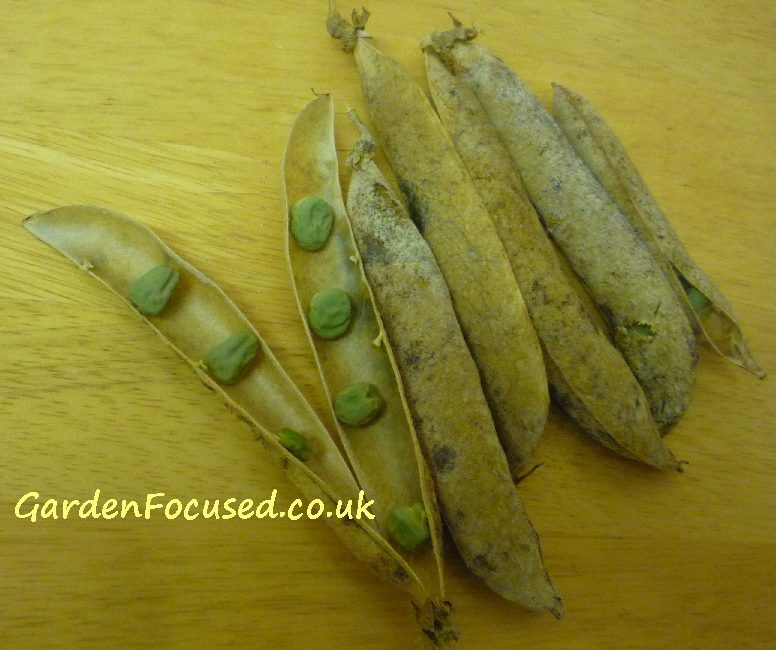 Click here for the full review of the Meteor pea variety. Alderman is also known as Victorian Colossal Climbing. This gets our recommendation as the tastiest pea variety of all. Massive crops with great resistance to pests and diseases. Click here for the full review of this variety. There are three key pests / diseases which affect peas. They are Pea Moth, Mildew and Pea Leaf Weevil. We have a page dedicated to identifying and treating these problems which can be found here. When you are harvesting peas, leave some of the pods (expect a minimum of six peas per pod) on the plant to harden off. When the pods are dry, on a dry day pull them off and keep them in a cool, dark and dry place for a day or so more. Prise the pods open, they should be crispy dry at this stage, and remove the peas. Quickly examine the pea seeds and if any have dark marks on them then throw the affected ones away. Label up an envelope or small paper bag and store the pea seeds in a cool, dry and dark place until they are ready to be used next year.